Dental x-rays play a big role when it comes to having good dental health, such x-rays are very helpful to and individual’s good oral care. 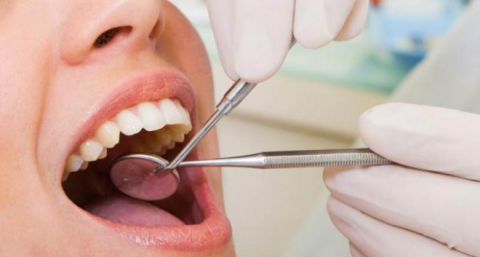 A primary reason why visiting the dentist is to detect any dental problems, with the help of dental x-rays the dentist will be able to complete a full examination of the mouth and detect any issues such as cavities, gum disease, oral infections and even some types of tumors that are not visible to the naked eye. Intraoral X-rays are one of the most common x-rays taken at any dental office. These x-rays provide a thorough examination of the tooth; it allows determining whether there are any cavities by the detail that these x-rays provide. It also allows checking the health of the tooth and the bone that is surrounding it. Types of intraoral x-rays are bite-wing x-rays, periapical x-rays, and occlusal x-rays. All these x-rays allow it to help monitor the status of any developing teeth and also the health of the general teeth and jawbone. The bite-wing x-rays show from the crown level of both top and lower teeth. These x-rays are to help detect any decay in the interproximal areas between the teeth. They also help check if there is any density within the teeth that has been cause by gum disease. Bite-wings can determine the proper fit of a crown or any cast restoration. The periapical x-ray shows the whole tooth starting from the crown to the root of the tooth. Each periapical x-ray includes a full dimension of the teeth. These periapical x-rays are used to determine whether there are any abnormalities within the teeth and also to detect whether there is any needed treatment to the nerve. The occlusal x-rays by showing the entire arch from both top and bottom parts of the mouth. These x-rays help determine the placement and development of a tooth. Another type of x-rays are panoramic x-rays, these x-rays capture the entire mouth in a single picture that includes the upper and lower jaws, all teeth , and tissues surrounding it. The use that these panoramic x-rays take is to detect any issues within the nasal area, maxillary sinuses, tooth positioning, gum and bone irregularities. Panoramic x-rays also help to plan any treatment for braces, dentures, implants and also extractions. What these x-rays can also help detect are any oral cysts, an advanced periodontal disease, tumors and oral cancer, impacted teeth, and sinusitis. Without the use of dental x-rays a visit to your dentist will not take a full experience as it would when having them done. This is why is it very important having your x-rays taken to be able to detect any issues inside your oral cavity. Dental x-rays play a big role as they help to detect any issues before they worsen and help you have a good dental health. This entry was posted in Uncategorized and tagged santa ana dentist, Smiles on Bristol, x-rays on October 22, 2015 by khosrow. Have you ever thought of whitening your teeth? There are many options in the market to getting a bright white smile. The first step in keeping a nice white smile is by brushing and flossing daily. If you’re not impress with that result then you can move to an over the counter product like, teeth whitening tooth paste, over the counter whitening strips or gels, and whitening rinses. If you’re looking for a faster result there is dental office whitening, and office take home kits. These have a faster result since they are prescribe to the dentist. Teeth whitening isn’t for everyone. The best way to determine if you’re a good candidate is by scheduling in exam and having a dentist evaluate your teeth. Teeth whitening is not recommended for people who have sensitivity on their teeth, the whitening procedure will increase the sensitivity and leave you with some discomfort. Whitening will not work if you have crowns, fillings, or other restorations these materials don’t whiten. Whitening is not recommended on younger patients than 17 and woman who are pregnant. It also is not recommend if you have dark or intrinsic stains (e.x fluoride stains) on teeth, you find the best result on yellowish teeth. What causes your teeth to change color? There are many factors that causes your teeth to change colors. The most common one is food and drink, the darker the food or drinks the more it stains the enamel. It is very important to brush and floss after every meal to avoid the staining of teeth. Age also plays a role, over time the enamel starts to wear off due to the brushing causing the yellow dentin to show more. Trauma can also affect the color of your teeth, if you had an accident and damage your tooth it tends to go darker. Some medication is known to stain teeth. Young kids or babies who have been exposed to antibiotics like Tetracycline, when they are young may have discoloration when they get older. There are some risks in whitening your teeth. You may experience sensitivity after or during your whitening treatment. The sensitivity you experience is temporary, it usually wears off in a day or two. If you do the office chairside whitening you may have some irritation on your gums or soft tissues. This irritation is also temporary and will stop in a couple of days. If you do experience these symptoms there’s always alternatives. If you’re chair side you can ask to stop treatment, and ask for some pain medications. 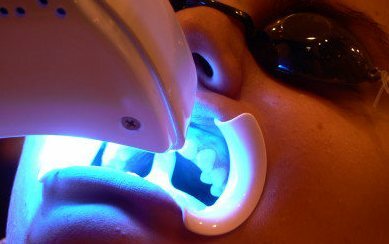 If you have bleaching trays it is recommended to lower the sessions. If you’re interested in having that beautiful white smile, research all the options you have. Consult with your dentist to see what option is best for you. This entry was posted in Uncategorized and tagged santa ana dentist, Smiles on Bristol, teeth whitening on October 19, 2015 by khosrow. Tooth Decay or caries is defined as cavity formation in teeth caused by bacteria that attaches to the teeth and forms acid in the presence of sucrose, other sugar, and refined starches. Dental caries are very common; there are more than 3 million cases per year. Caries usually occur on children and young adults but it can happen at any age. Tooth decay occurs when bacteria forms acid that eat the tooth away. This can leave a hole in your tooth known as cavity. Symptoms for caries usually begin when the caries hasn’t been taken care of for a long period of time, or when there is an infection. There are a few symptoms you may experience if you have caries. Your tooth may start to change into a darker color; brown, yellow, or black. Pulsing or pain on tooth is another symptom; this tends to happen at night when you are resting. It also can be a sign that the cavity is affecting the nerve. Bad breathe or swelling of your tooth can also be a symptom. There are a few ways to treat a cavity; this all depends on how long the cavity has been left untreated. The most common way to treat a cavity is by doing a dental filling. They clean the caries out and the doctor decides what type of filling material is used. Another way to treat the cavity is by placing a crown on your tooth. This happens when the cavity is affecting a large portion of the crown of the tooth. They remove all affected part of the tooth and then place a buildup material that gives the tooth some shape. Its then prep to a stump and they take an impression of your tooth send it to the lab where the final restoration will be made. You go home with a temporary crown while your crown is being fabricated. If the cavity is affecting the nerve a procedure called root canal is needed. 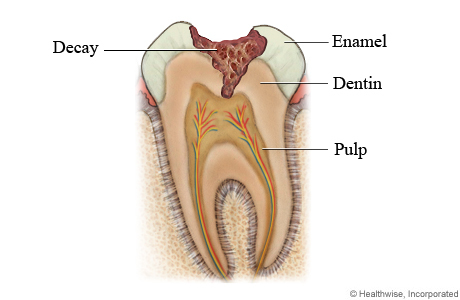 The root canal treatment is when they remove diseased tissue from the pulp chamber. It is then replaced with a special material called gutta percha. After root canal is finished they begin with the preparation of a crown for that tooth. If the caries is untreated and it affects the root of your teeth the only treatment would be to extract the tooth. 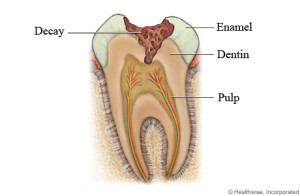 The prognosis to restore a tooth that has cavity in the root is every low. The best way to prevent caries is by brushing and flossing daily at least twice a day. This will remove all plaque and bacteria left in the mouth from food debris. Avoid sugary or sweet foods, drinks or candy. If sugar is left on your teeth for a long time it can damage the tooth. For kids, don’t put them to sleep with bottle this can cause baby bottle decay. Schedule regular dental exams and cleanings. If you have any question regarding caries you can consult with your friendly staff in Smiles on Bristol Dentistry. This entry was posted in Uncategorized and tagged santa ana dentist, Smiles on Bristol, tooth decay on October 15, 2015 by khosrow. 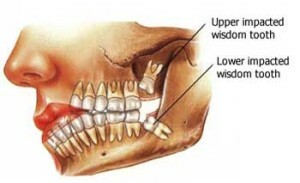 Wisdom teeth or third molars are the last teeth on each side of the upper and lower jaw. Wisdom teeth begin to erupt at the age of 17 to 25. There are some cases that they being to erupt at much earlier age. In most cases there are only four erupting wisdom teeth, but in some other cases there can be less than four or even more than four in these cases the extra erupting teeth are called supernumerary teeth. When wisdom teeth are erupted they can easily affect other teeth as they become impacted. This is when extraction is needed. Wisdom teeth symptoms can start from having pain on the back of the mouth, behind the molars, this pain will gradually increase as the wisdom teeth continue to grow misaligned or sideways inside the mouth. Other symptoms that can occur when eruptions happening are pain, redness, tenderness, and swelling around the area. Not only that, but you can also feel a tingling sensation on the cheeks when laying down. When wisdom teeth are being erupted fever can appear and you can also feel fatigue due to the muscle spam. Since wisdom teeth are the last teeth to come in/erupt the space they have is very limited in the oral cavity. Since there is no space for the wisdom teeth to accommodate it leads them to be impacted. When this happens, swelling and tenderness occurs around the area and this is when extraction is needed. When this extraction treatment is needed, the erupted teeth will be removed. After, extraction a light amount of pain and swelling may occur, but should go away within a few days after extraction. The removal of wisdom teeth should not cause affect the bite due to any crowding or impaction. After surgery is completed swelling in the face and neck are common. Ice packs and any other pain medication prescribed by dentist or oral surgeon can help minimize the swelling and/or pain. Dry socket is a complication that can occur when having a wisdom tooth extracted. This dry socket occurs in the first 5 days after the tooth had been extracted. This happens when the blood clot breakdown and the nerves and bone are exposed. This dry socket is very painful only 2 to 5% of people will develop a dry socket. To help minimize the pain of this dry socket the oral surgeon will rinse out the empty pocket and to remove and debris. An antibiotic can be prescribed to help decrease the pain and have less discomfort. If there is proper care taken the healing procedure should be done within 7 to 10 days. A related condition to this is Periocornitis, this condition happens when there is not enough space for the wisdom teeth to erupt. This dental infection occurs when the wisdom tooth is partially erupted and this allows for food or plaque to lodge under the gum tissue. This entry was posted in Uncategorized and tagged santa ana, Smiles on Bristol, wisdom teeth on October 12, 2015 by khosrow. For over 40 years Fluoride has been a main source to help combat dental caries. Fluoride is not only a source to help combat dental caries but, also helps slow down the demineralization of the tooth and helps enhance the mineralization of the tooth. Fluoride has been released into the environment through both air and water, as it is the most abundant element on earth’s crust. According to Santa Ana dentist, Dr. Kalantari, there are many ways of obtaining Fluoride – one is by prescription-strength which is applied at a dental office, another one is by nonprescription-strength which is obtained over the counter and can be used at home, and fluoridated water which can be found in both community water and bottled water. Fluoridated water has been used for over the years to help lower tooth decay among people whose water supply contained levels of Fluoride. Studies have shown that water containing fluoride helps re-mineralize the tooth. Two other ways are systemic fluoride and topical fluoride. Systemic fluoride which is very common is ingested by food, beverages, and supplements. When being ingested it is absorbed through the intestine which leads into the bloodstream and from there transported to any tissues that need it. Lastly, there is topical fluoride which is directly applied to the teeth through tooth paste or mouth rinses. How does fluoride work? Fluoride works in two ways one is the pre-eruptive development and post-eruptive development. Pre-eruptive development is when tooth is not erupted if systemic fluoride is present it will help strengthen the enamel as is it developing. Sources of systemic fluoride: food and beverages and prescribed dietary fluoride supplements. Post-eruptive development is when tooth is fully erupted if the fluoride is still present it will continue to strengthen the enamel crystals and make it more acid resistant. Having the right amount of fluoride helps prevent dental caries, however the excess of fluoride can result into dental fluorosis. Dental fluorosis is visible changes caused to the enamel surface of the tooth. These changes can vary from mild forms of staining to other severe forms. Dental fluorosis can also occur to pre-eruptive teeth when infants consume too much fluoride, over long periods of time. For this parents should be counseled on the results of the use of too much fluoride. However, fluoride used with moderation is a great source to combat dental caries as it has been proven since the 1930’s by dental researchers who showed that having natural fluoride present helps keep stronger and healthier teeth. This entry was posted in Uncategorized and tagged dental clinic, dentist, dentistry, Fluoride, santa ana on October 5, 2015 by khosrow. The dental auxiliaries are the first line of defense for early detection of oral cancer. More than half of neck and all head cancers develop in the oral cavity. The American Cancer Society estimates there is approximately 39,500 who will or have develop oral cancer in 2015. That is almost 2,500 increase since 2010. In 2010 there was around 37,000 people who were newly diagnose or were diagnose with oral cancer. This rate increase can be from younger people using tobacco products as well as a newly recognized viral linked. According to the Oral Cancer Foundation people who were diagnose at an early stage have an 80 to 90% survival rate. It is very important to have regular dental checkups at least twice a year. The most common risk factors for oral cancer according to Dr. Kalantari, a Santa Ana dentist, are tobacco use and alcohol consumption. Smoking and drinking increase the risk exponentially. You also have a higher risk if the consumptions is in large amounts. There is also strong direct connection with the human papilloma virus (HPV). The HPV associate with oral cancer is higher in men than in women and higher in younger adults. Patients who develop oral cancer through HPV respond to treatment very well, and have a higher survival rate than other cause by other factors, the reason is still unknown. Early signs are very difficult to detect without a thorough examination by a dental professional. The main treatment options with people that have oral cancer are surgery, radiation, chemotherapy, and newer targeted therapies. These options can be used alone or mixed combination depending on the stage and place of the tumor. Patients who are treated early have little in the way of post treatment disfigurement. Those whose cancer is caught late have to go surgical removal of the disease and may require reconstruction of their oral cavity. You can take a step in early detection by conduction a self-exam. You can examine the floor, tongue, and the roof of your mouth, and lips, look and feel for any abnormalities. Dental exams are also very important because there might be some spots that are very difficult to see on your own. If you have any questions you can always come to visit Smiles on Bristol Dentistry/Santa Ana. This entry was posted in Uncategorized and tagged best, dental clinic, dentist, dentistry, oral cancer, orange county, santa ana on October 2, 2015 by khosrow.